The annual Venture Atlanta conference brings together hundreds of investors across the country and offers rich networking opportunities for entrepreneurs and investors alike. So here are a few tips to help you make the best of the conference. Research presenting companies and attending VC firms ahead of time. Entrepreneurs will need to be realistic about the number of meetings and the types of firms to reach out to prior to the conference. Learning about the investor firms, the sectors and company stage they are interested in will enable a higher outreach to scheduled meeting conversion rate. Social Media. Once you’ve determined who you want to meet at the conference, see who in your social media network can make a warm introduction on your behalf. Or reach out to the individual via social media to explore an informal chat prior to the conference. 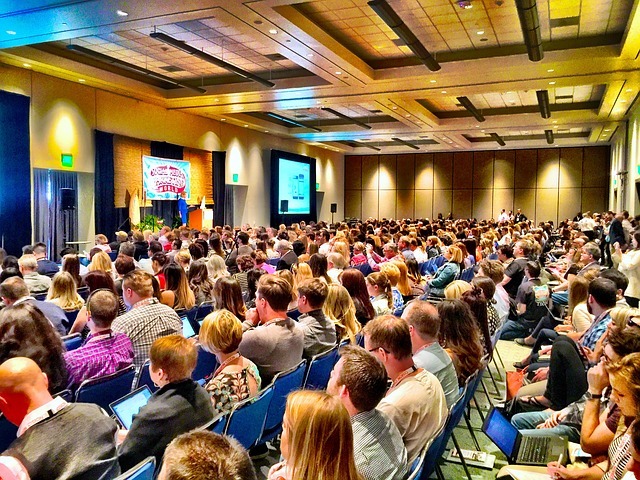 Create a Twitter list of the speakers and people you want to meet and engage them before the conference so that you can have more focused conversations at the conference. Also, create a Twitter search stream using the official conference hashtag #VENATL18 to keep a pulse on pre-conference buzz. Download the Venture Atlanta conference app. Use it to manage your schedule, request meetings and message fellow attendees. Practice Your Elevator Pitch. Have your elevator pitch down to 2 sentences prior to the conference and be prepared to tailor your pitch at the conference based on the questions asked in response. Networking Breaks. During scheduled networking breaks, resist the temptation to check email. Instead, engage with fellow attendees in the common areas and at your table. Work the room by bringing your curiosity. Large groups can be intimidating. The rule of thumb to effective networking is to be a good listener. Be sure you can quickly explain your company’s value in a sentence or two then get to know the person you are talking to by showing a genuine interest in them. Explore common interests, acquaintances and experiences. Collect business cards. This is especially important if you want to develop a relationship with the individual over the next 12 months. Have a pen ready so that you can jot notes on each card about the interaction and follow-up steps. Alternatively, take a picture of their business card and write them a note on LinkedIn. Pick a different table during each spoken session. You may default to the table closest to the exit but try and sit with a different group/table each session. This will allow you to meet the largest number of people. Use Social Media. Engage with speakers, fellow attendees, etc., by tracking the Twitter search stream that you created prior to the conference. Tweet mentions to companies and speakers whose message resonated with you. If the topic discussed by one of the panels is of interest to your customers, consider live streaming the panel using Facebook Live. Connect with each person via social media immediately and do explore connections that you can help make for them. For Atlanta-based connections, follow-up with an email with an appropriate message at the end of the conference or that same week. For non-Atlanta-based connections, wait to follow-up the Wednesday or Thursday following the conference so that your email doesn’t get lost in the inbox.